This might be the last NaNo update I post this year. It’s been real. It’s been a blast. But I’m getting stressed. Not pressured, where you write and are like “I can do this! RAH ME! Go, team, go!” No. This is obsessive stressed. Like, “If I don’t do this right and stay ahead, I am going to DIE before the month is out” stressed. 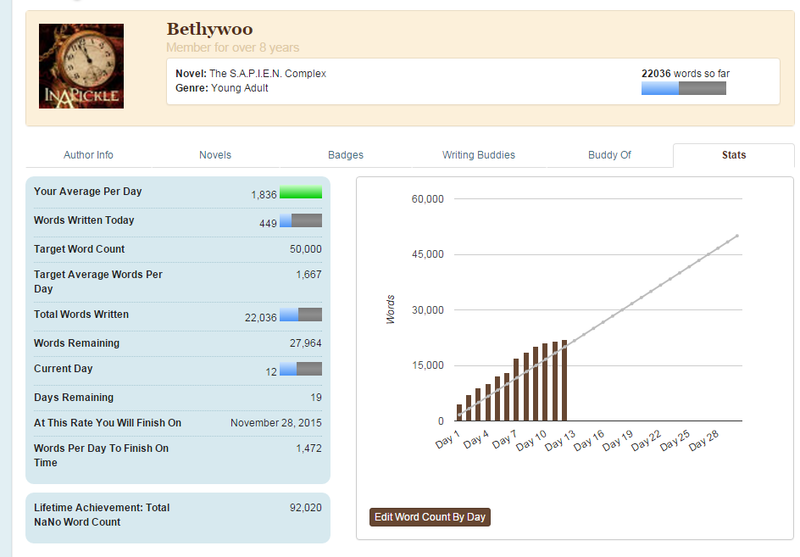 But look at that lifetime achievement total: 92,020! Seriously though, I hope you’re not feeling down about this. 🙂 That there is 20k words more than when you started two weeks ago, and that sure as heck isn’t “losing” at this whole writing game. Take a break–then, when you’re ready, get back at it at a more comfortable level of warpspeed, eh? Because I think writing yourself to death went out of fashion with Coleridge.